Enjoy the wonderful promenades and hiking trails in the neighbourhood. For sportive recreation the "Freizeitpark" in Zell am Ziller is very suitable. Tennis (3 indoor and 4 outdoor courts), Minigolf, Beachvolleyball, Streetball and Basketball, Soccer or Bowling, everyone can find something of his lliking, of course there is also the "Erlebnisschwimmbad" (outdoor swimming pool) with several chutes and a resaturant. 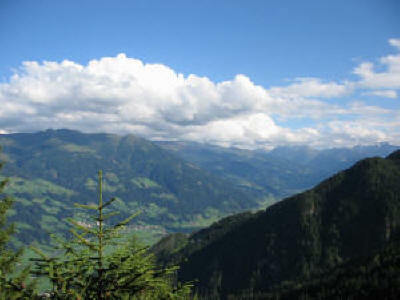 And who wants to see the Zillertal from the air can enjoy himself with paragliding or deltaflying. And for those who prefer the water we have rafting and canyoning. 232 Mountainbikekilometers with direct connection between Zell, Gerlos and Konigsleiten/Wald (Salzburg) are waiting for the ambitious Mountainbiker. Goldschaubergwerk Zell: Enjoy a journey back in time ...Gold in Zell im Zillertal - This fascinating underground experience goes hand in hand with an adventurous walk: you´ll start at the local cheese dairy museum and the Heinzberg zoo, then pass the Flörlmoos chapel, the museum of local history and the Maria Rast pilgrimage chapel to finally arrive at your starting point. Now it´s time to have a closer look at the gold mine itself. After an incredible journey which will make discover the secrets of the underground you´ll take a rest at the Knappensäule column, where miners used to thank the Virgin Mary for protecting them.